Setting out on the promotional tour for latest album Ceremonials, Florence +the Machine touched down in the United Kingdom after already having put shows on in Asia, America and Australia since it kicked off in October of 2011. With over 80 dates between then and its last in Sweden, on the 14th of August 2012, I was hoping I'd get to see her when she reached my home town of London this month, but it wasn't to be...initially. The Cardiff Motorpoint Arena was surprisingly compact- well compared to the other "arenas" I'd been to- and featured mainly standing room only. The smaller size was a blessing though, and meant that it offered a pretty good view of the stage from wherever anyone was stood. So I got to see Florence Welch pretty close-up, without having to venture anywhere near the claustrophobic crowd that gathered at the front of the stage. 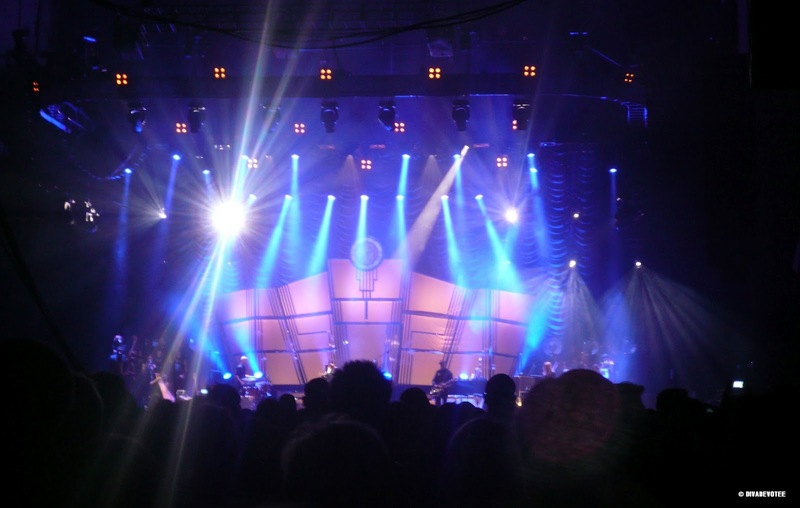 The stage itself was simple, but in keeping with elegant Art deco inspired look Florence has been sporting in this era, and the concert itself featured no additional set pieces or costume changes during its running time. Instead dramatics were delivered by Florence’s stage presence and her soaring voice. Quite a challenge for someone only on their second tour, but she managed it with frightening ease. We got our first glimpse of Florence as a willowy silhouetted figure as the bells of Only If For a Night rung out through the arena. Stood stationary, in shadow, she basked in the screams of her excited audience for what felt like an eternity, leaving the anticipation and excitement to grow unabashed. When the silhouette became flesh, Florence was revealed with hair tied loosely in a bun, sporting a severe, focused look and shrouded in a black cape that made her pale skin appear luminescent in contrast. This introduction gave the show an almost supernatural quality, as if we were witnessing the appearance of a musical apparition from another realm! 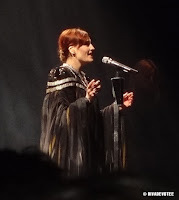 For the first half of the show, it has to be said, Florence remained cool, collected and slightly aloof from the crowd, almost as if in a trance and not entirely aware of their presence. However, the enthusiasm and participation of the crowd eventually warmed the singer and she began to reciprocate and feed off the energy, loosening up considerably by the second half of the show. By which point the singer was running around, hanging off the stage and calling out the host city name to rapturous applause. Florence’s voice was consistently on point, and its haunting and piercing timbre is something that can't really be appreciated unless heard live. Her voice was agile, flipping between registers with an ease I’ve never witnessed before, and its strength never wavered during the hour and a half set. 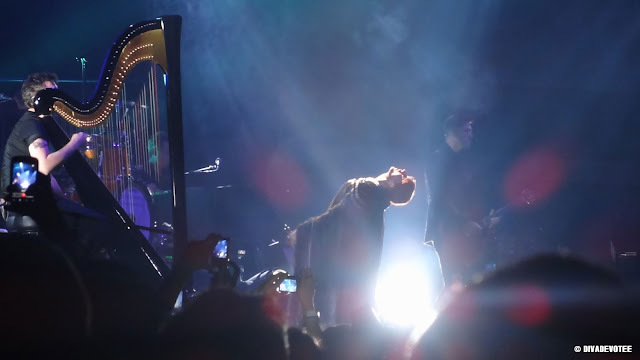 The held note of No Light, No Light was goose bump inducing and had the crowd's frenzy growing exponentially as every second it resonated on passed. Florence is without a doubt a vocalist of incredible skill, but what seeing her live demonstrated most was the intelligent way she wields it to control an audience so thoroughly. It's a skill, along with her demeanour, that marks her out as serious a showman or performer as any of her contemporaries . Florence minus the cape. This clip gives you a sense of the clarity and strength of her voice, as well as the effect she was having on the crowd. Florence looking like a Victorian superhero as she does the Wonder Woman "presto-chango" twirl with her billowing cape! London: At practically the last minute-two days before the show to be exact- my cousin managed to get her hands on tickets for the London, Alexandra Palace show on Friday the 9th of March. 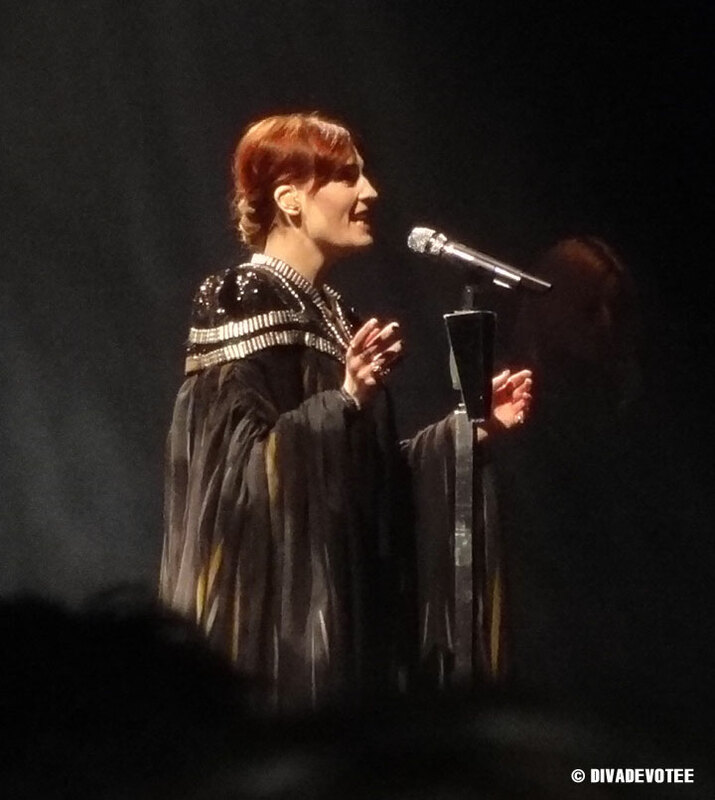 So, this lucky blogger had the pleasure of seeing Florence + The Machine live, twice in one week! Madness, I know! At this show it was clear that Florence was happier to be on home turf- I'm not a psychic, she just said it repeatedly- and her whole demeanour was softer and more relaxed, engaging with the crowd from the get go. This was the floaty, perhaps "real", Florence of the Lungs era making a return. The result of this was that the drama, gravitas, as well the emotional impact, of the show was lost somewhat when compared to the one I'd seen earlier in the week. However, the main, real difference between the two shows was the audience. Perhaps because the London lot didn’t have to work for the stars affection, the crowd were more reserved and less responsive, and didn’t have the same vigour or energy that the Welsh crowd displayed. It wasn't like the terracotta army had taken up residence, but you could feel it was missing that spark and warm appreciative atmosphere that the other gig had possessed in abundance. The voice was still exceptional and the music, which was provided by her once again phenomenal backing band and singers, fitted better with the magical setting of The People's Palace. In any case, I still had a great night, and I recommend to anyone who can get tickets for the Ceremonials Tour to do so because you won't be disappointed. Saw her AND LOVED HER! Great Review! I missed her last year here (Edinburgh) and was gutted as my mates said she was phenominal! I am just proud that us brits are consistently churning out really talented females who can not only write beautiful songs but also perform them to a incredible standard. Just think, Adele, Jessie J, Ellie Goulding ect ect. Oh and just out of interest DD do you like Lucie Silvas?